← Yes, I’m going to sing a Frozen song…. My mum had a hands on approach to love. There were hugs and cuddles and bedtime snuggles. Touches and tickles and bedtime kisses. Even when I was 40, she would take my hand to walk down the road, and throw her legs over mine on the sofa. But it is her hands that fill my childhood memories – our hands embedded in a bowl of cake mix, our hands entwined on the sofa, her hands knitting me jumpers that were always too long, her hand stroking my face goodnight. They stroked my hair when we watched TV, they stroked my back when I couldn’t sleep. The week of her stroke when the doctors told us to prepare for the worst, and as she clung on to life, I clung on to her hands. I held them tight and the desperation of thinking I would never see them or feel them again nearly broke me. She was dying and her hands would never touch me again. So I pulled the curtain around us and I pressed her hand in some clay I had got to take an imprint of my new daughter’s footprint. Like so much with the sandwich years, my child’s footprint and my mum’s handprint were moulded from the same clay. 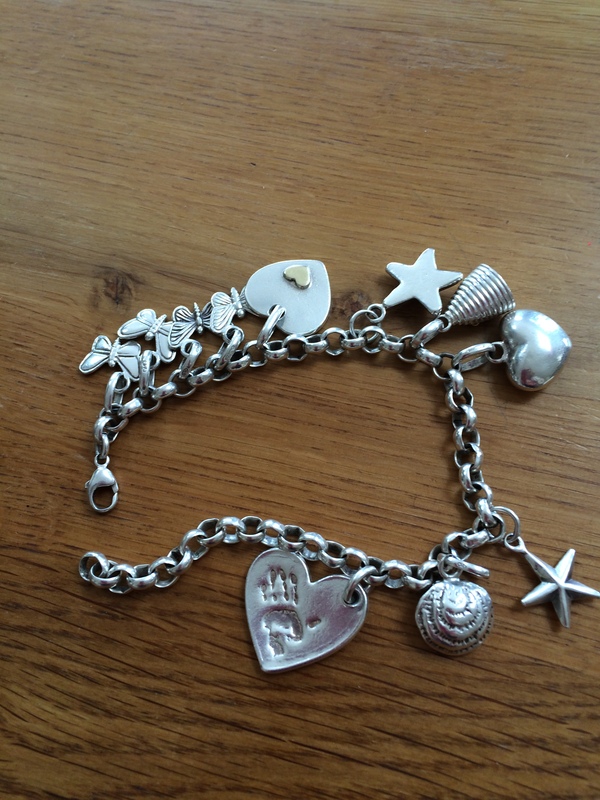 I sent it off and it was made into a silver charm which I wear every day…. her hand always by mine. She didn’t die – not in exact terms – and even now, she reaches out the one part of her she can move and I take her hand, and we sit. Touching love. And I always wear her handprint on my wrist to remind me of her handprint on my heart. It felt strange when I married someone who wasn’t really a touchy person. Love is a hands on thing. For me anyway. I think you are either a hand holder or you are not. Maybe it’s something you learn from your mother. I certainly learnt it from mine. And I am the same mother to my girls. I’m a hand holder. I love the feel of our fingers entwined, or their little hands cupped perfectly inside mine. I touch them every chance I get… a hug here, a squeeze there. And when we all watch TV we are entwined like slithering snakes, a wonderful weaving of arms and legs. Daisy is growing up. I’ve been brutally informed I am no longer allowed to hug her in the school yard. I am, however, permitted a perfunctory pat on the shoulder (and have had to practise with her to ensure I get it right!). Yet as soon as we are home she jumps up and wraps her legs and arms around me, and no goodnight is complete without a back rub and a hug….. just as long as nobody sees! Poppy is a tree hugger, an animal hugger and a people hugger – she loves to hold hands and snuggle. Poppy touches instinctually, her sleep routine at night a touch fest of stroking her ‘Pinkie’ a strange soft cloth doll she’s had since she was a baby. And Ruby is a born toucher. She hugs me like there is no tomorrow, she puts me in head locks and won’t let go. Every night is a wrestle to wiggle my arm free from her clutches. She grasps life and I know she will touch every corner of it. And so our growing menagerie of animals is like touch therapy right now. As I face single-dom and single parenting I miss my mum’s touch more than ever. Even now. And while I touch the girls with reassuring hugs and stokes (and restrained school yard pats) and they touch me with clinging intensity as their world changes shape, the animals seem to know we all need a little extra touch of love. The dog never leaves my side. He sat yesterday with his head on my leg as I wrote at the kitchen table. The cat purrs his sultry sleek body around my legs and body, literally rubbing me with affection. The kitten, well, he’s just a small ball of love. His intensity to need and give affection is only matched by Ruby. And you know, even the hamster has his value. I love the fact he comes with instructions to Handle Daily. I think we should all come with those instructions. Poppy is touched by the responsibility to care for her little bite-sized ball of need (bite-sized indeed if my cat anything to do with it!). And so as the rawness of our changing lives exposes us to the harsh elements of life, the touches of our loving lives protects us in a warm cocoon of care. And tomorrow we pack our bags and head into the sun for a week. We need it. I need to hang out with my girls without the pressure and pain we have lived under for the last few months. We need to lie entangled in bed, swim and slip around each other in the pool, sit on the shore, feet piled together under sand, walk hand in hand with the warmth of the sun touching our faces. I’m single. But I am touched. And that is making all the difference.